Opening weekend $6.201 million on 940 screens. 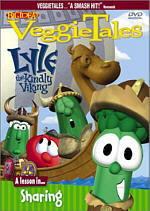 Fans of Christian-oriented animated vegetables rejoice! In 2002, the VeggieTales gang made the move to the big screen with their first film release, Jonah. If you worry that the Veggies went Hollywood, don’t fear, as the group transitioned to the nation’s multiplexes well. Really, in many ways Jonah feels like a longer, more lavish episode of the video series. I don’t mean that as an insult, as the film maintains the genre timbre of the prior programs. At the start, we see a group of kids being driven to a Twippo concert by Bob the Tomato (voiced by Phil Vischer) and Dad Asparagus (Dan Anderson). Problems arise along the way. For one, Laura Carrot (Kristin Blegen) gloats because she alone possesses a backstage pass for the concert, and this gets on Junior Asparagus’ (Lisa Vischer) nerves. In addition, Dad plays his guitar in a way that interferes with Bob’s driving. This sends the car off-course and into a ditch. Along the way, Laura’s pass flies out the window, and Junior taunts her since he thinks she got what she deserved due to her attitude. The gang spy a seafood restaurant, and they head there to call for a tow truck. They meet the Pirates Who Don’t Do Anything, and despite their name, they teach Junior about compassion. They relate the tale of Jonah (Phil Vischer), the messenger of God. He gets a special message to go to Nineveh, but since it’s a nasty place, Jonah doesn’t want to go. He doesn’t think they deserve a message of mercy and he tries to slip out of his duties. To do so, Jonah arranges a voyage as far from the land-locked Nineveh as possible. He heads on a boat toward Tarshish, and the Pirates take him that way. On the trip, he meets Khalil the caterpillar (Tim Hodge), a traveling businessman who thinks highly of Jonah and even sells merchandise with the messenger’s image on it. God punishes Jonah for his refusal to deliver the message, and a storm rocks the boat. The crew make Jonah walk the plank to end the storm; it works, and they then try to rescue him. This fails, but Khalil winds up with Jonah as a giant whale swallows both. While stuck in the gut, angels deliver a message to Jonah to tell him to seek forgiveness. He does so and eventually winds up in Nineveh, where he finally fulfills his original task. Jonah and Khalil also reunite with the Pirates, and much excitement ensues. If you want Jonah to offer something radically different than the VeggieTales videos, you’ll walk away disappointed. However, I regard its general faithfulness to the source as a positive. To be sure, the film opens up its horizons to a moderate degree. The artwork and animation seem significantly stronger than seen during the shows. Not only did the flick boast a bigger budget, but also it clearly enjoyed a longer period in which it was created. The extra time obviously allowed the filmmakers to present a more lush and vibrant world as demonstrated by substantially more detailed and involving backgrounds and sets. Otherwise, Jonah remains true to the VeggieTales universe, and I like that. I don’t want to see something tremendously extravagant, as I don’t look for that in VeggieTales. Instead, I want to see a low-key and moderately amusing moral tale, and that’s what Jonah offers. No one will ever mistake me for a religious person, and that makes my enjoyment of VeggieTales something of a surprise. While the programs definitely display a Christian tone, they don’t push this heavily on the viewer. Yes, you’ll hear mentions of God during Jonah, and these seem a little more frequent than in the average VeggieTales program. However, the tone never appears preachy or strident, as the references evolve naturally within the program. I’ve recommended VeggieTales to parents who don’t possess any real religious beliefs, and I think nothing in Jonah causes me to deter them from the moral message; the modest Christian trappings don’t appear heavy enough to turn off many viewers. VeggieTales shows usually feature one overarching theme, and Jonah focuses on compassion and mercy. As with the religious concepts, the movie doesn’t batter us with these concepts. The one potentially over-the-top moment comes during the gospel number performed by the angels in the whale, as it goes on too long and comes across as a bit too much. Still, even this sequence doesn’t detract from the program’s generally low-key tone. As with prior VeggieTales pieces, Jonah boasts a nicely sly and irreverent sense of humor. Actually, the gags come as a moderate surprise given the religious settings, as I don’t expect wackiness related to God. Some of the gags seem predictable, like the inevitable Jaws reference, but the movie features enough clever wackiness to alleviate any portentous elements. As the folks at Big Idea pursued their first motion picture adventure, they didn’t stray too far from the model, and that’s a good thing. 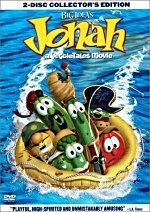 Jonah – A VeggieTales Movie provides a generally charming and amusing experience that fits in nicely with the prior video programs. It shows enough improvements to merit the move to the big screen but it remains true to the series’ origins. Fans of VeggieTales should feel pleased with this effort. Jonah – A VeggieTales Movie appears in both an aspect ratio of approximately 1.85:1 and in a fullscreen version on this single-sided, double-layered DVD; the widescreen image has been enhanced for 16X9 televisions. Only the letterboxed picture was reviewed for this article. Prior VeggieTales DVDs looked very good, and Jonah seemed even stronger than those, as the series’ first big-screen incarnation came to home video in a very positive manner. Sharpness appeared immaculate. The image always came across as tight and well defined. Never did any softness interfere with this distinct and accurate presentation. Unlike the prior VeggieTales discs, this one suffered from no jagged edges or moiré effects, and edge enhancement also seemed to be absent. Print flaws presented absolutely no concerns, as the movie showed no signs of any form of defect. As one might expect from a cartoon presentation, Jonah offered a broad and varied palette, and the DVD replicated those tones wonderfully well. The tones always appeared bright and vivid, and they also seemed rock-solid. I noticed no issues related to bleeding, noise or other issues, as the movie seemed clear and vibrant. Black levels were deep and dense, while shadow detail was appropriately dark but never overly opaque. In the end, Jonah looked simply terrific, as it offered a very positive presentation. While the Dolby Digital 5.1 soundtrack of Jonah didn’t quite match up with the excellent visuals, it still worked nicely for the film. The soundfield maintained a general orientation toward the forward channels. In that domain, the audio showed nice stereo imaging and a good sense of presence. Effects seemed appropriately placed within the spectrum, and they meshed together cleanly. Localization appeared very good. Surround usage mainly supported the music and effects from the front speakers, but they also added some distinct material at times. Those elements appeared mostly during the shots at sea, especially during the big storm sequence. Audio quality was very positive. Dialogue came across as natural and distinct, and I noticed no issues related to edginess or intelligibility. The film’s score sounded terrifically bright and dynamic, and the music seemed smooth and bold throughout the movie. Effects were clean and accurate and also packed a good punch when appropriate. Bass response sounded deep and tight and accentuated the track. The mix for Jonah sounded very good as a whole and just fell short of “A” level. This two-DVD release of Jonah packs a serious roster of extras. On disc one, we start with a whopping three audio commentaries. The first comes from directors/actors/writers Phil Vischer and Mike Nawrocki, both of whom sit together for this running, screen-specific track. Vischer and Nawrocki prove to be very energetic, and they offer a lively and entertaining look at their film. They cover a broad range of topics. They tell us why they decided to adapt the original Biblical tale and also go over story and script evolution, animation challenges, character decisions, musical choices, and many other issues. Vischer and Nawrocki maintain a very chipper and amusing energy throughout their chat, and they help make this a fun and compelling track. The second commentary comes from producer Ameake Owens and director of animation Marc Vulcano, both of whom were recorded together for their running, screen-specific piece. Though not quite as peppy as Vischer and Nawrocki, this pair offered a generally good look at the film. Mostly they covered technical issues. Animation techniques and problems dominated the piece, but they also told us of various other tidbits related to the production. The track sagged at times and occasionally seemed a little redundant after the first piece, but this discussion nonetheless provided a fairly involving and informative look at the film. 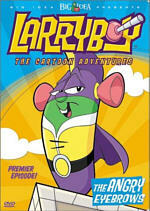 For something lighter, we get a commentary from Larry the Cucumber and Mr. Lunt. Ala similar tracks such as one on The Country Bears, this one puts Vischer and Nawrocki back in the recording studio chair, but this time they chat in character. Obviously improvised, the track provides a very lively and amusing experience. The pair play off each other well, as their characters tell silly stories from their side of the production. This piece could have easily turned dopey, but it actually works really nicely, and it should entertain listeners. As we move to DVD Two, we find scads of additional extras. Within the “Behind the Scenes” domain, six pieces appear. Making the Movie runs 11 minutes and seven seconds. It combines movie shots, behind the scenes images, and interviews with directors/writers/actors Vischer and Nawrocki, producer Owens, animation director Vulcano, art director Joe Sapulich, executive producer Dan Philips, and story supervisor Tim Hodge. They cover the evolution of the script, their choice of VeggieTales characters, the new studio they entered for the film, how they deal with the animation of limbless characters, inspiration they took from their kids, visual development of the whale, other animation issues, casting Khalil, improvs, rendering problems, and other topics. The piece ends in a puffy and self-serving way, but otherwise it offers a lot of good information in a tight little package. “Making” includes one branching feature. At around the eight-minute mark, you get the chance to leave the featurette and hear some adlibs created for one scene. When those finish, the program resumes. These tidbits are very fun to experience and provide a lively and interesting extra. Entitled The Studio Process, the next featurette lasts seven minutes. Producer Owens hosts it, and we also hear from Nawrocki, VP Visual Development Michael Spooner, Hodge, story artist Todd Carter, Sapulich, actor Lisa Vischer, supervising editor John Wahba, modeling supervisor Ian Hubbard, modeling artist Hyun Huh, Vulcano, lighting artist Luke Martorelli, director of technology Henry Vera, Philips, and composer Kurt Heinecke. This program essentially recaps the entire production process. Animation fans will already know much of the information, and others will probably find this piece to fly by too quickly to offer enough depth. “Process” seems like a passable primer but nothing more than that. Next we go to the Big Idea Tour, a 12-minute walk through the studio hosted by Phil Vischer. He leads us around the mall-based rooms and gives us his irreverent commentary along the way. We meet some folks we already know from other parts of this disc as well as new people. Though the tour doesn’t include much real information, it still seems fun and should entertain fans. Another featurette, Jonah and the Bible lasts five minutes and 29 seconds. It features Phil Vischer on his own as he discusses the original tale. Vischer relates the changes they made to it for the film and gives us a very nice recap of those issues. Elsewhere on the DVD, we hear of the problems the crew encountered when they tried to cast Khalil. Within Khalil Auditions, we get to hear four failed attempts to grab the role. Each clip lasts 47 seconds and covers the same scene between Khalil and Jonah. These are interesting to hear, especially since one of them takes its cues from Brando’s performance in The Godfather and another presents the world’s worst Jack Nicholson impression. “Behind the Scenes” ends with a collection of Character Bios. Larry the Cucumber, Bob the Tomato, Laura Carrot, Pa Grape, Mr. Lunt, Junior Asparagus, Archibald Asparagus, and Khalil. These provide cute little examinations of the different Veggie personalities. Now we move to “The Music”, which splits into five different areas. The Score provides a seven-minute, 56-second featurette that involves Phil Vischer, composer Kurt Heinecke, and Ameake Owens. The men relate the way they work together and how they create musical themes, and we also learn about the recording process. The program ends with a before and after demonstration of the score’s impact upon the film. Though fairly brief, “The Score” still provides a decent look at the topic. To get more information about musical development, we check out the Score Progression Reels. These cover two scenes: “Walking the Plank” and “Entering Nineveh”. There allow us to hear the music at various levels of creation. They vary from Vischer’s crudely hummed and sung ideas to early MIDI tracks to the final 5.1 mix. Each snippet lasts 68 seconds, and both offer a very cool examination of this area. After this we go to the “Bonus Material” section with its six pieces. Taking a cue from the Pixar folks, we get two collections of Outtakes. Actually, we find the same five-minute and 42-second set of snippets twice; the second one offers the segments translated into Spanish. This sort of feature was cute when they offered a new idea back in 1998, but they’ve gotten old since then. To track the animation progress “from sketch to finish”, we go to the Progression Reels. These cover three scenes: “Jonah Enters Joppa” (18 seconds), “Ship Deck Fun” (45 seconds), and “Rescuing Jonah” (38 seconds). Unlike the traditional multiangle presentation, these snippets show all four stages on one screen. That’s a good idea as an option, but these still should have allowed us to examine the different elements separately. Despite the awkward presentation, the material seems interesting and useful. Concept Art presents 39 drawings and other pieces. In an interesting choice, we can check these out the standard way or with commentary. We hear from VP of Visual Development Michael Spooner (eight minutes, 55 seconds) and art director Joe Sapulich (22 minutes, 12 seconds). The art itself seems interesting, but the commentary adds a lot of additional information. Spooner and Sapulich cover many different elements of visual design; we even hear about Sapulich’s voluntary prison confinement! This section provides a great look at the topic. During some of the other extras, we hear about rendering mistakes. We see a few of these in the Digital Dailies. Hosted by Larry the Cucumber, Mr. Lunt and Khalil, the 15-minute and 26-second piece shows all sorts of freaky errors that occurred during the creation of the flick. These are moderately interesting, and the commentary makes them a little more entertaining. “Bonus Material” ends with Extra Countertop Scenes. This six-minute and 19-second piece shows snippets of Larry and Bob on a countertop as they chat up the flick. Archibald won’t come out of his dressing room, so they deal with that issue. Preachier than the movie itself, this segment pours on the morals but it seems amusing otherwise. A number of ads show up in the “Trailer and Previews” domain. We get the teaser and full trailer for Jonah itself. We also discover promos for the home video releases of The Ballad of Little Joe, Larryboy and 3-2-1 Penguins! as well as ads for a Jonah computer game, and the Jonah soundtrack. Called “Fun!”, the final area offers six different components. Khalil’s Answering Machine lets us hear the caterpillar’s greeting messages and incoming messages. It’s a cute little piece. The Jonah Sing-Along lets you croon along with “Jonah Was a Prophet”. The presentation allows you to use the audio button on your remote to turn on or off the character vocals. The Trivia Challenge comes with two levels: easy and hard. I went 10 for 10 on both, but the “hard” questions did require a little more thought. Unfortunately, completion offers no reward. Similar to a feature found on many Disney DVDs, Interactive Storybook allows kids to read along with a tale. Called “Even Fishslappers Need a Second Chance”, they can have it told to them or read it on their own. Mike Nawrocki does the story ala Larry, and it’s a fairly cute little enterprise. Two pieces appear in the Family Fun Activities. “Blind Puzzle” requires families to get out some kids’ puzzles and teaches cooperation. “Second Chance Card” instructs families how to make certificates that can be used for future forgiveness. 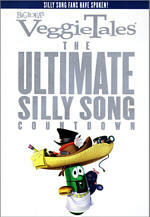 Like every other VeggieTales DVD, Jonah includes a number of Easter eggs. Go right from the “Spanish outtakes” to see an amusing extra. The French peas create their own bootleg video of Jonah, as they tape the flick during a theatrical screening. They chat and argue when they get caught in this 139-second clip. Click to the right of the 3-2-1 Penguins! ad and you’ll get access to a “Chinese bootleg box cover” for a VCD. I don’t know if this is fake as well, but it looked legit – for a phony release, that is. Move left from “Billie Joe McGuffrey” and you get to hear Khalil’s motivational audiotapes. Lastly, click right from “DVD-ROM Fun” and you’ll hear some alternate sayings from the talking Jonah plush toy displayed by Khalil. Go right from “Bonus Materials” on the main menu, and we see something called the “Rusty Sprockets Show”. This talk program features an interview with Bob and Larry. It’s an amusing fake promo. Finally, Jonah tosses in some DVD-ROM Fun. The “Games” area offers five fairly crude Macromedia Flash-powered contests: “Thrills ‘n Quills”, “Cargo Bounce”, “Fish Dodge”, “Pea Dash” and “Moby Blaster”. “Moby” offered a moderately fun remake of the Atari classic “Breakout”, but the others seemed pretty weak. We also get a demo for the Jonah PC CD-ROM game plus the film’s script. The presentation of the latter appears awkward, as you need to read it through a word processor, but it’s still a nice extra. Finally, the DVD ends with links to websites for Big Idea, Big Idea Fun, and the Jonah official page. Another gently amusing VeggieTales product, Jonah provides a reasonably entertaining experience. The film usually makes its point subtly and it offers enough humor and fun to ensure that many will enjoy it. As for the DVD, it provides stellar picture quality along with very solid sound and a seriously deep and enjoyable package of extras. A nice movie and a terrific DVD, families should find a lot to like about Jonah.